A moist three layer red velvet cake covered in smooth peppermint cream cheese frosting and crushed candy canes. A perfect holiday cake! Christmas is officially less than two weeks away! Are you ready or are you totally freaking out now that I pointed that little fact out? Are the presents wrapped and under the tree yet or will they be put out on Christmas eve after everyone is sound asleep? Presents will absolutely be wrapped by Christmas Eve here, some or probably most will be wrapped that night. I’d say it’s because I’m a slacker, but really it’s that I’ll take no chances in the kiddos finding things before it’s time! And I know what kids do when they know there are presents around… from personal experience. Such a troublemaker around the holidays! I’ve never been a fan of surprises. I was always excited for the presents and of course the dessert table, so whenever I get to whip up a holiday dessert, I might get a little giddy planning it out. There’s just something special about Christmas treats. From cookies to bars, candies and of course cake – there are so many amazing possibilities! I didn’t grow up with red velvet cake or red velvet anything. I only finally experienced it within the last couple years, but I’ve grown to love it’s bright festive color, perfect for a variety of holidays and celebrations. 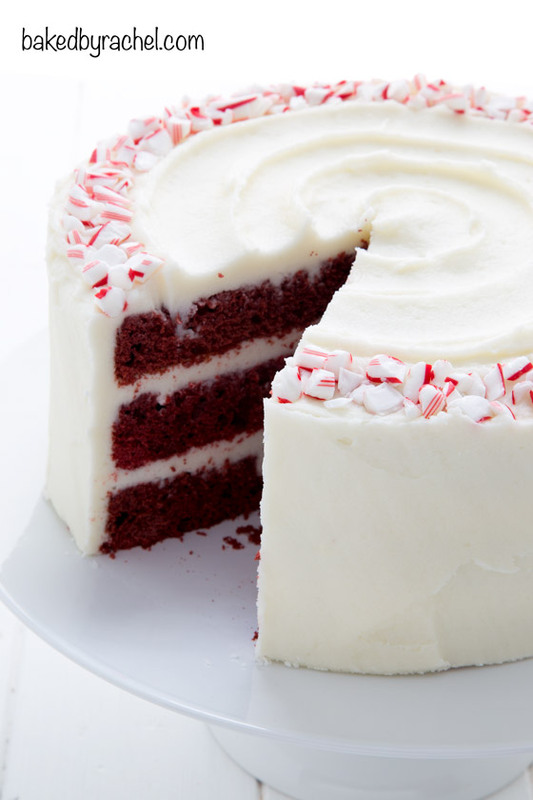 What’s more festive than a red cake with crisp white frosting and crushed candy canes?! This cake needs to happen now. Drop everything you’re doing and make this moist red velvet layer cake with peppermint cream cheese frosting. Grab a slice while you can because I promise your family and guests will gobble it up! A festive cake both in color and flavor, thanks to McCormick food color and extracts. The perfect cake for all of your holiday parties! Love holiday baking? 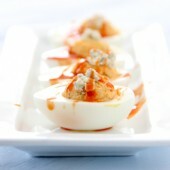 Create your FlavorPrint profile at McCormick to get personalized recipe recommendations for the holiday season! Grease three 8-inch round cake pans with baking spray. Line the bottoms with parchment paper. Lightly grease the top of the parchment paper. Set aside. In the bowl of a stand mixer, beat together butter and both sugars. Mix in eggs, followed by sifted cocoa powder, vanilla, salt, baking powder and red food color. Scrape sides and bottom of bowl as needed. Alternate additions of sour cream and flour, finishing with flour. Finally, in a small bowl combine vinegar and baking soda. Immediately add to cake batter, mix just until combined. Divide cake batter between prepared pans, roughly 1 1/2 cups of batter per pan or 6-7 large cookie scoops worth. Use a small offset spatula to spread into an even layer. Bake for 18-20 minutes or until a toothpick inserted comes out clean or with only a few moist crumbs clinging to it. Cool for 5 minutes in pan, then carefully remove from pans to cool on a wire rack. When room temperature, wrap in plastic wrap to chill thoroughly. When ready to proceed, prepare frosting in the bowl of a stand mixer. Beat cream cheese until smooth. Mix in butter, followed by 1 cup of powdered sugar at a time. Cover mixer with a clean towel to prevent sugar escaping. Mix in peppermint extract in last 60 seconds. Level off and remove any dome from chilled cakes with a serrated knife. Add several large cookie scoops worth of frosting to first layer of cake, spread out into an even layer. Top off with second tier and repeat. Finally add third cake, top off with additional frosting to cover the top and sides of the cake. *This is just a crumb coat. A thin layer of frosting is sufficient. Cover cake with remaining frosting, smoothing out with a bench scraper. Use a spatula or spoon to create a swirl in the top. Decorate with crushed candy canes. Chill cake until nearly ready to serve. This will help to set the frosting. Recipe serves roughly 10-20, yields 1: 8-inch round, 3 layer cake. It looks BEAUTIFUL! 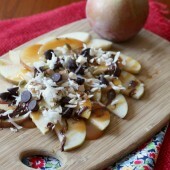 So festive-what a wonderful Christmas dessert! Love your blog. Your pictures are great. This is such a gorgeous cake, Rachel! 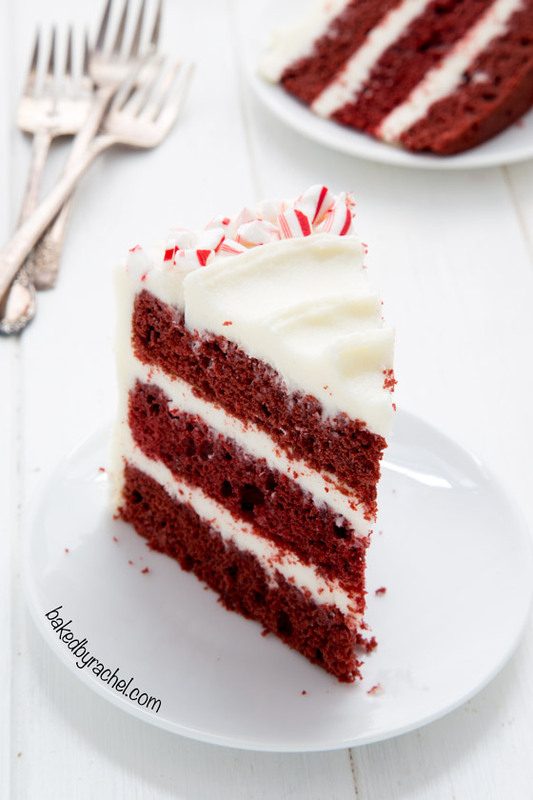 Love that dark deep red with the perfect layers of cream cheese frosting (my favorite!). The addition of peppermint is genius! Holy BEAUTIFUL cake batman! This would definitely be a show stopper at the Christmas table! Now, to see if it gets there before I eat it all ;) Pinned! The color of red velvet coordinates so well with the peppermint. Very festive. I love it. You make the most beautiful cakes! This screams CHRISTMAS to me. I get giddy too when thinking about and planning the big holiday dessert ., you already know this but this cake is stunning and love love love the peppermint cream cheese frosting, yes!!! Gorgeous cake! 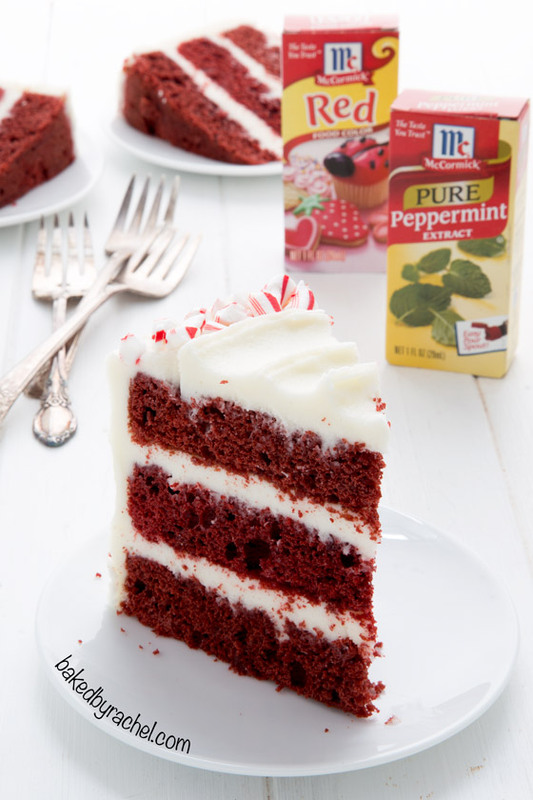 I love the addition of the peppermint and I always love baking with McCormick! I will gladly take a slice off of your hands. The cake looks so perfect!! I loveee the deep red contrast with the bright white frosting. The shattered candy canes as a topping is so simple and elegant!! I absolutely love wrapping gifts. I turn on the holiday music and dance along as I tie the bows. This cake rocks my world. Pinned. Well, you know how I feel about red velvet!! This cake is stunning, and I’m in love with the peppermint frosting! Stunning cake, Rachel. 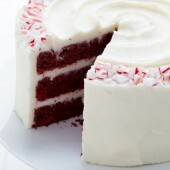 Love the peppermint frosting addition to the red velvet! Peppermint frosting? Shut the front door! You did it again, Girl! Wowzers! That is a gorgeous looking cake! We always wrap presents on Christmas Eve with a bottle of spiked eggnog :-) Why do it early right? Haha! That sounds like a fun idea! Wow! That sounds delicious and looks beautiful! What a beautiful cake – the frosting is perfect!! Peppermint cream cheese frosting?! Yes, please! That peppermint cream cheese frosting! All desserts are fun, but holiday desserts are the most fun. I can’t wait to try this! This cake would be a showstopper at any holiday table! Gorgeous! Love the contrast of red velvet cake with the white frosting. Love that you added peppermint extract! can’t decide what’s more gorgeous – the cake or the photos! I love it all! Aww you’re too sweet. Thanks Angelyn! You know how I feel about cake… ;) Really this is gorgeous! Impressive indeed!! I do… and I feel the exact same way lol ;) But thank you!! Oh my word! I am dying! This is gorgeous!!! Hi! I’d like to try this for Christmas. Could you please advise me how to bake it in 9-inch pans — should I use all three, or only two? Thanks! You could likely do it either way. Split the batter in half and cook for a slightly longer time. Or cook three layers. Bake time will definitely vary for a larger/thicker cake, so you’ll need to keep your eye on that. Good luck! Unfortunately, this one didn’t really work out for me. The batter was very thick and although I tried thinning it with about half and half, it still ended up quite dense and firm, and would not even spread to the pan edges. It was definitely closer to cookie batter than cake. 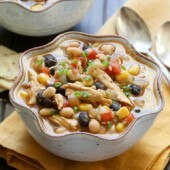 Are flour proportions correct on this recipe? The amounts listed are correct. It sounds as though your measurements may have been off. While this isn’t a liquidy batter, it is absolutely spreadable and not anywhere near cookie dough consistency.